The Academy of Music at 14th Street between Third Avenue and Irving Place was a sufficient home for opera. Its resident impresario, James H. Mapleson, or better, Colonel Mapleson, as he liked to be called, delivered the stars his patrons considered their due. But as the city's upper crust grew in size and, more to the point, in financial clout, it became apparent that the Academy was saddled with a fatal flaw: its too few boxes could not accommodate New York's growing elites. And further, on those rare occasions on which a box became available, it went to a member of the tight Knickerbocker circle and not to one of "the Newcomers." Approached by George Henry Warren, a Vanderbilt lawyer, for a way out of the impasse, leading Academy stockholders offered to increase the number of boxes from eighteen to forty-four, a supply still substantially short of the demand. Worse, the twenty-six additions would not necessarily be in the coveted proscenium. The occupants would be less advantageously exhibited than they thought befit their station. And so the proposed remodeling was rejected and the campaign for a new opera house was on. Within days, Warren had secured the required capital through sixty-two subscriptions. The central committee of the infant Metropolitan Opera Company met on April 10, 1880, and agreed to move forward with the project, later recapitalized by the Vanderbilts, the Morgans, the Roosevelts, and others. There were bumps in the road: negotiations for a site on 43rd Street and Madison Avenue fell through; at a later point, the anticipated costs had so escalated that there was pressure to abandon the undertaking altogether. In the end, will and fortune prevailed and, amazingly, in just two and a half years, between the March 1881 acquisition of the 39th Street block and the October 1883 opening, construction was completed, the boxes (ultimately tagged at $15,000 each) were assigned by lot, an impresario was hired, and the inaugural season launched. Sembrich was the product of the pedagogy of bel canto, itself derived from the technique of seventeenth- and eighteenth-century virtuosi. Briefly put, bel canto is founded on the most rigorous command of the breath, indispensable to the accuracy of intonation and to the emission of equalized, linked tones from the bottom of the range to the top, whether singing piano (softly), singing forte (loudly), or executing the messa di voce (the swelling and diminishing of a note). The perfection of breath control is also essential to the free and even use of fioritura (embellishment): melismatic trills, turns, appoggiature (grace notes), scales, arpeggios, and other figures of the bel canto rhetoric. Well into the nineteenth century, all students of singing were expected to master the technique and its battery of florid ornaments. Later, the ornaments became the nearly exclusive property of the high soprano. Following Lucia, Sembrich went on to play the other bel canto heroines of the 1883-84 season: Vincenzo Bellini's Elvira (I Puritani) and Amina (La Sonnambula), and Gioacchino Rossini's Rosina (Il Barbiere di Siviglia). Tribune critic Henry Krehbiel leveled his sarcasm at the "lugubrious" I Puritani, charging it with "a simplicity that is almost amusing"; W. H. Henderson (of the Times from 1887 to 1902, then of the Sun until 1937) thought the soprano irreproachable and the orchestra and chorus in better form. The Evening Post extoled the principals of La Sonnambula, Campanini, who, in the space of a few days, sang a lyric Elvino and a heroic Lohengrin, and Sembrich, who lent the sleepwalker the "warm, emotional quality" of her voice, her bravura, her "artistic discrimination and taste." As for Il Barbiere di Siviglia, the Times opined that "without a great Rosina" it would be "simply unbearable," to us a startling appraisal. But then, the Met had a great Rosina. During the inaugural season, Sembrich applied her refined art to many other roles: Violetta, Gilda, Zerlina, Martha, Ophélie, Marguerite de Valois, and Juliette. It would be another seven years before New York built a venue expressly for opera, and it would be twenty-two more and three tries before one such effort, the Academy of Music, would become firmly embedded on the city's cultural map. However different the three failed enterprises, they had in common the near monopoly of bel canto on their stages. The first, the Italian Opera House, owned and administered by a group of business and civic leaders, was another effort on Da Ponte's part to bring opera to his adopted country. From the time of Garcia's visit, Da Ponte had been a vigorous proponent of Italian music and letters, and professor of Italian literature at Columbia College, the first such position in the United States. The Italian Opera House (1833-1835), a small theater located at Leonard and Church streets, opened with Rossini's La Gazza ladra. Nine years later, Palmo's Opera House (1844-1847), also small, seating only eight hundred, opened on nearby Chambers Street. For a single season it was owned and operated by Ferdinand Palmo, a former restaurateur, who raised his first curtain on Bellini's I Puritani. Bellini shared the season's bill evenly with his two bel canto competitors, Rossini, of course, and Donizetti. In contrast to the Italian Opera House and to its immediate successor, the Astor Place Opera House, Palmo's mission was to bring opera to the people at prices families could afford. But his target audience of immigrants had not swelled to numbers sufficient to support his intentions. For the next two years, a series of directors and companies made doomed attempts to rescue the project. As with the Italian Opera House, Palmo's small capacity and mediocre casts were the undoing of the balance sheet. On the heels of Palmo's demise came the Astor Place Opera House (1847-1852), administered, like the Italian Opera House, by wealthy patrons. Each company had presented a fall and spring season of nineteen operas (Abbey added a twentieth for Philadelphia alone); nearly half the titles were identical, for the most part bel canto and early Verdi works. The titles exclusive to Mapleson were Rossini's La Gazza ladra and Semiramide, Donizetti's Linda di Chamounix and L'Elisir d'amore, Bellini's Norma, the Ricci brothers' Crispino e la comare, and Verdi's Ernani. With the exception of Aïda and Roméo et Juliette, none of the Academy's offerings was thought of as modern. The contrasting profile of the Met emerged from relatively recent French works, along with Lohengrin, Arrigo Boïto's 1868 Mefistofele, and the first US performance of Amilcare Ponchielli's La Gioconda, premiered at La Scala in 1876. Abbey, unlike Mapleson, was bent on demonstrating that his "Grand Italian Opera" was alert to the public's predilection for Wagner and for contemporary fare. Lohengrin showed off the company to marked advantage, and although sung in Italian, of course, this edition of Wagner prompted Krehbiel to make the case for Abbey's more inclusive policy. A passionate Wagnerite, he cited the audience's patience as proof "that the patrons of the opera in New York are ripe for something better and nobler than the sweetmeats of the hurdy-gurdy repertory, and that a winning card to play in the game now going on between the rival managers would be a list, not necessarily large, of the best works of the German and French schools" (Tribune). Mefistofele and La Gioconda were, for the most part, well performed. By all accounts, Campanini and Nilsson sang Boïto's Faust and Margherita to far better effect than they had when impersonating the same characters in Gounod's version on opening night. Krehbiel chose to take issue with the opera itself, "the novelty of Boïto's conception having worn off"; he now found it "bizarre . . . inane, insipid, when it is not positively vulgar in style" (Tribune). Despite the misfire of its act 2 explosion, the premiere of Ponchielli's sumptuously staged La Gioconda elicited lengthy and mostly positive reactions. Henderson, who thought it "among the most important art occurrences of the season," placed the composer in "a sort of half-way ground between Verdi's latest manner and the moderate productions of Wagner," his score, though unoriginal, containing "much that is beautiful and impressive." While Henderson judged Nilsson ill cast in a role intended for dramatic soprano, Krehbiel reported that she "kept the audience in a state of almost painful excitement by the vivid manner to which she depicted the sufferings of the street singer" (Tribune). He was harsher on Ponchielli than his colleague, charging the composer with resorting to "the old style." The two magisterial critics agreed that the enterprise did credit to the fledgling company by offering "grand opera in a style worthy of the metropolis" (Tribune). Performed in Abbey's new raiments, some of the "old style" operas made strong impressions. On the third night of the season, Il Trovatore introduced Roberto Stagno. The tenor thrilled the audience with his long-held high B at the end of "Di quella pira." The Azucena of Zelia Trebelli "was a triumph of high vocal art worthy of being ranked with Madame Sembrich's brilliant performance on Wednesday" (Tribune). On hearing the Leonora of Alwina Valleria, the Met's first American-born diva, the Tribune declared, "there can be no 'off night' at the Metropolitan so long as she relieves either Madame Nilsson or Madame Sembrich" (Tribune). Soprano Emmy Fursch-Madi had glowing notices for her Alice in Meyerbeer's Robert le diable. Fursch-Madi was also compelling as Ortrud to Nilsson's Elsa and as Donna Anna in a Don Giovanni that flaunted Nilsson as Donna Elvira and Sembrich as Zerlina. Abbey's Met had its fair share of disappointing evenings as well, many occasioned by the weak contingent of male singers. Stagno soon found that his reliable high notes did not suffice to trigger favorable reviews for his Don Ottavio (Don Giovanni), Jean de Leyde (Le Prophète), Lionel (Martha), and Enzo (La Gioconda). Italian baritone Luigi Guadagnini was trounced as Rigoletto: "It is a thousand pities that the poor man came so far to do so little" (Times). In an underprepared Mignon, Nilsson was judged to have fallen short of her own more youthful and graceful performance of thirteen years earlier, when she had introduced Ambroise Thomas's portrait of Goethe's touching waif to America. Trebelli's Carmen compared unfavorably to Minnie Hauk's, New York's first, in 1878. Thomas's take on Hamlet was denounced as lèse-Shakespeare in its solitary New York hearing. With the exception of Nilsson, Campanini, and Scalchi, the principals of Les Huguenots were "simply earnest, correct, and lifeless" and the orchestra "almost continuously irresponsive to Signor Vianesi's baton" (Times). The lesson of the Met's first season was that Thomas, Bizet, and Meyerbeer, not to mention Wagner, Gounod, Boïto, and Ponchielli, had eclipsed "old" Italian opera. Verdi's Rigoletto, Il Trovatore, and La Traviata and the bel canto works fell well below the 1883-84 box-office average, trailing far behind Faust, Lohengrin, Mignon, La Gioconda, Les Huguenots, and Don Giovanni. No one, not even Marcella Sembrich, could stem the tide. In the interest of protecting their investment, the pro-bel canto box holders took a grudging back seat to the ticket-buying public. The influential coterie of Wagnerite critics that had railed often and loudly against the dramatic implausibilities and musical shallowness of Italian opera, together with the "ultra musical people in the gallery," had won the day. In a moment of particular hauteur, Krehbiel dismissed Rossini, Bellini, and Donizetti, throwing in Verdi for good measure, for clinging to "the petty world of feelings," the "skeleton" for their abiding and exclusive interest in melody (Tribune, Nov. 6, 1883). For the next seven years, the war would be waged not between two houses and two companies, but as a latter-day "quarrel of the ancients and the moderns." Lucia, Elvira, and their sisters lived on at the Academy for the remaining season-and-a-half of Mapleson's tenure. At the Metropolitan from 1884 until 1891, its German years, Donizetti was absent, Rossini was represented only by his French grand opera, Guillaume Tell, and Bellini was confined to just three performances of Norma. When Lucia di Lammermoor was revived for the formidable Nellie Melba in 1893, Henderson, unmoved, pronounced the opera "dead to the world" (Times, Dec. 5). And so it went for decades. Caruso himself was unable to shield the 1904 premiere of Donizetti's Lucrezia Borgia from the vituperations of Krehbiel ("a mouldering corpse") and Henderson ("empty formulas . . . without a trace of dramatic characterization"). In fact, bel canto programming continued to be so spotty that partisan critical attacks were largely moot. The beginning of the turnabout came with the February 18, 1918 revival of I Puritani. Without explanation, the Bellini that Krehbiel had once pilloried was suddenly a model to be emulated: "If only the composers of Francesca da Rimini or Mârouf could exchange three-quarters of their orchestral mastery for a tithe of the lyric ecstasy which floods the operas of Bellini, the world of modern opera would take on a more hopeful aspect" (Tribune). Krehbiel's conversion aside, I Puritani served the critic's present purpose: to bludgeon Riccardo Zandonai and Henri Rabaud, whose operas had had recent Met premieres. A week later, Krehbiel devoted an entire column to a summary of I Puritani notices, nearly all glowing (Tribune, Feb. 24). When Olin Downes became principal music reviewer for the Times in 1924, bel canto found a true champion. He took the occasion of the January 18, 1926 production of Il Barbiere di Siviglia to celebrate Rossini. The next year, it was Bellini's turn. Norma retained "a surprising amount of its formal strength, its beauty and eloquence" (Nov. 17, 1927). And he loved La Sonnambula: "The music unfolds one faultless melody after another, always appropriate in warmth or pathos or tenderness to the emotion of the text, yet never violating the shape of the formal musical speech" (March 16, 1932). By the mid-1930s, the bel canto operas most frequently revived at the Met, Lucia di Lammermoor, Il Barbiere di Siviglia, L'Elisir d'amore, Norma, and Don Pasquale, were no longer wanting for rehabilitation by the critical establishment. They had stood the test of time and belonged to the ages. Least of all Joan Sutherland. And she had none of Callas's instability in the upper register, none of the weakness of most coloraturas in the lower. Her 1961 Met debut as Lucia was front-page news (Herald Tribune, Nov. 27). Twelve minutes of curtain calls saluted the "Mad Scene." Alas, cameras and microphones were absent. Two months later, television's Bell Telephone Hour documented her star turn live, preserving not only the voice of "la Stupenda," but the impact of her interpretation. As her career progressed, Sutherland was often perceived as an indifferent actress. In this telecast, she makes vivid the young woman's hallucination, the encounter with her beloved by the fountain, her joy at hearing the wedding music, the tender evocation of love, the febrile search for the invisible flute. For the nearly fourteen minutes of scrutiny by the cameras, the singer's virtuosity serves the drama. Sutherland's complete Lucia was captured in a Met telecast on November 13, 1982. At fifty-six, less nimble of foot and, naturally, less fresh of voice, hers remained the standard to be met. The Metropolitan has stood among the grandest of opera companies since its birth in 1883. Tracing the offstage/onstage workings of this famed New York institution, Charles Affron and Mirella Jona Affron tell how the Met became and remains a powerful actor on the global cultural scene. In this first new history of the company in thirty years, each of the chronologically sequenced chapters surveys a composer or a slice of the repertoire and brings to life dominant personalities and memorable performances of the time. From the opening night Faust to the recent controversial production of Wagner’s “Ring,” Grand Opera is a remarkable account of management and audience response to the push and pull of tradition and reinvention. Spanning the decades between the Gilded Age and the age of new media, this story of the Met concludes by tipping its hat to the hugely successful “Live in HD” simulcasts and other twenty-first-century innovations. Grand Opera’s appeal extends far beyond the large circle of opera enthusiasts. 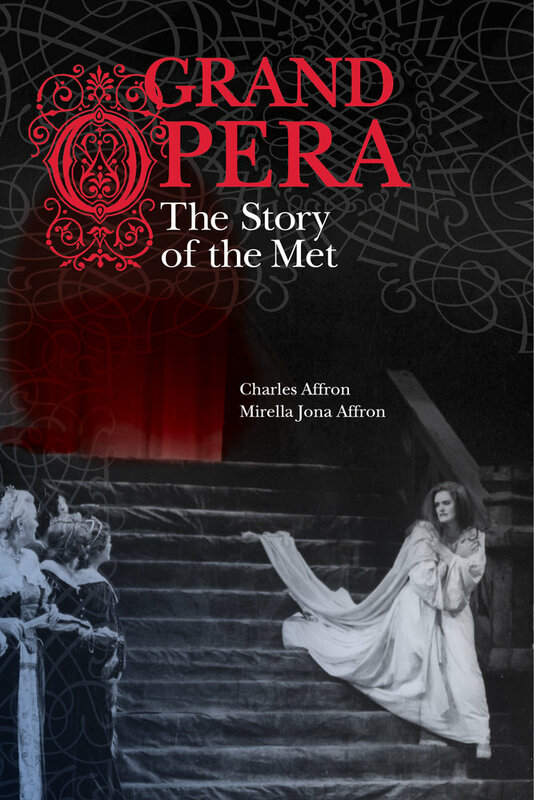 Drawing on unpublished documents from the Metropolitan Opera Archives, reviews, recordings, and much more, this richly detailed book looks at the Met in the broad context of national and international issues and events. "Richly detailed . . . For better or worse, where the Met goes, other companies follow; and as the Affrons’ gracefully written and finely researched history so often reminds us, the history of the Met is frequently the history of opera itself."